from the campsite to the thermal pools. Wellness with a Prlekija twist. An entertainment programme that will make you forget all about the TV. Largely shaded by trees, this campsite with a separate nudist area is a great choice for a holiday in touch with nature. Take a look! Spending a holiday in pristine nature where you can count the shooting stars to the sound of crickets is a privilege. Even if you have yet to discover the magic of camping, you are sure to enjoy your stay at Sončni gaj Camping. You can rent a fully equipped family tent, splash around in the water park, pamper yourself with Prlekija wellness treatments and meet the fairytale heroes of Banovci. With our busy entertainment programme, you won’t have time to even think about the latest technological gadgets. The Banovci thermal water springs were capped and used to fill 2,000 m2 of swimming pools with waterslides and water features that will surprise and e ...ntertain. Our water park is perfect for children’s games, as well as total comfort and relaxation. It comprises 7 indoor and outdoor thermal water pools with temperatures from 25 to 38 °C. Terme Banovci also has an outdoor pool in the nudist campsite – far and wide the only thermal water pool for reserved exclusively for nudists. Designed in the unique style of Prlekija, our wellness centre will take you to a fairytale world of relaxation. You will discover the magical sauna pr ...ogrammes with natural – and sometimes delicious – ingredients and sauna sessions at the full moon or new moon. 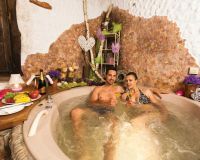 Baths inspired by angels, fairies and pirates will bring out the romantic in you and make you smile. We’ll turn your daily routine upside down. We’ll pamper you and leave you to rest by the pool, but you’re sure to run out of time for reading bad news ... or checking your work e-mail. We like to teach our guests – big and small – something new every time: be it baking bread and the Prlekija layer cake or pottery and discovering the local legends, sights and popular daytrip destinations. Activities vary depending on the season and theme. 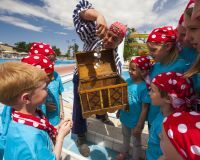 During the school holidays, your children will spend a few hours every day in the company of Edi the Pirate, Franček the Detective, Krumpeki and other Banovci characters. Millions of years ago, this area lay beneath the Pannonian Sea. Some people say the sea accumulated from the tears of a water nymph, whose reflection ...you can still spot in the Banovci thermal water on nights when the moon is bright and full. The thermal mineral water of the springs in Banovci comes from a depth of 1700 m. Because it is rich in fluoride, it has a positive effect on rheumatic conditions and post-trauma and post-operative conditions of the bones, joints and muscles. The beneficial substances in the water are mild and gentle, making for a pleasantly relaxing and refreshing bath. 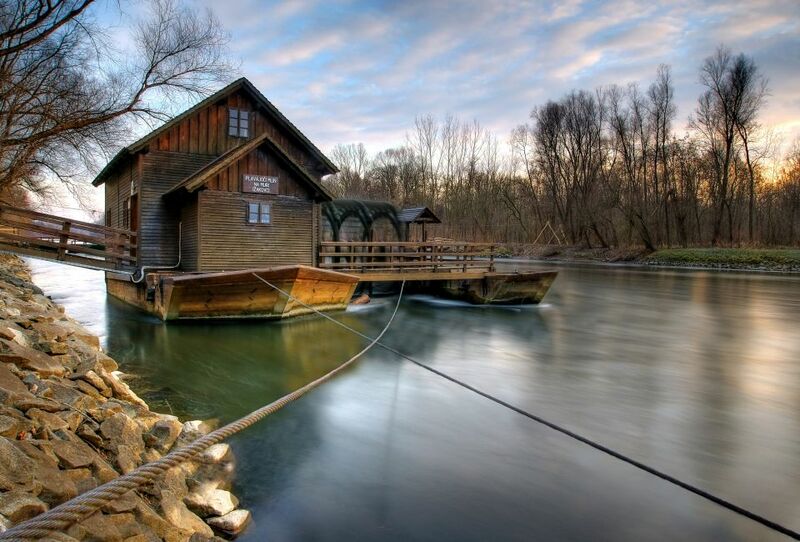 Far from urban centres and far from the madding crowd, you will find Prlekija: a veritable paradise for hiking and cycling, exploring the mysterious river or visiting beekeepers, potters and millers. The area is known for its fine wines and delicious "finger-licking" food. Sports enthusiasts will relish in canoeing on the Mura, horse riding, watching the horse races, flying a powered paraglider. You will meet the creatures gliding through the air spewing fire, dragons, in the local legends. Accessible on foot from the campsite, the Babič mill on the Mura sells flour and buckwheat groats. Jeruzalemsko-Ormoške gorice is famous for its fine wines and agritourism farms with vineyards and wine cellars. Bees, busy bees… Just a short walk from the campsite you can learn everything you’ve ever wanted to know about bees. Famous far and wide, the Ljutomer horse races have a long tradition. Food like grandma used to make.